Anyone can make this ridiculously easy Gooey Caramel Chocolate Dump Cake. No box mixes, only a short amount of time to throw it together, and this humble cake can be satisfying any chocolate craving. Combine all of the ingredients in a large bowl. Stir with a whisk until it is completely combined, making sure to run the spatula around the sides of the bowl to make sure all of the ingredients are incorporated. Store any leftover mix in an airtight container is a cool, dark space. Preheat the oven to 350ºF. Grease a 9×9-inch baking pan. Pour the soda across the bottom of the pan. Drizzle the caramel evenly across the pan. If the caramel is too thick, you can warm it up in the microwave until it pours easily. Sift the dry cake mix evenly in the pan. (Make sure you are only using 1 cup of the cake mix – not the whole batch that you made earlier.) 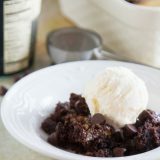 Drizzle the sweetened condensed milk over the top of the cake mix, then scatter the chocolate chips over the top. Place the butter slices evenly over the top of the cake. Bake the cake for 30-35 minutes. At about 25 minutes, check the cake, taking a spatula or large spoon to moisten any spots that still have dry cake mix showing by spread from wet sections next to it. Continue to bake until the cake looks cooked. Cool the cake for about 20 minutes before serving. Serve with a scoop of ice cream, if desired.